Glyphosate resistant Canada fleabane has been confirmed in 28 counties throughout the province. Some counties also have multiple resistant Canada fleabane which is resistant to both glyphosate and ALS or group 2 herbicides. It is finding its way from fields of corn, soybeans and wheat into orchards and vineyards at an amazing rate. Therefore, we need to know what we can do to control what is there to prevent the further spread of this multiple resistant weed. Canada fleabane (also known as horseweed or mare’stail) is a winter annual weed. Its seed will either germinate in late summer and over-winter, or in the spring. Effective management strategies should focus on removal of seedling plants both in the fall and in the early part of spring. Since small fleabane plants are not deeply rooted, many different types of tillage implements provide good control of this weed. Canada fleabane rosette just starting to bolt. Adequate control will occur at this growth stage or smaller. Growth Stage of Canada Fleabane in the field now (July 10). 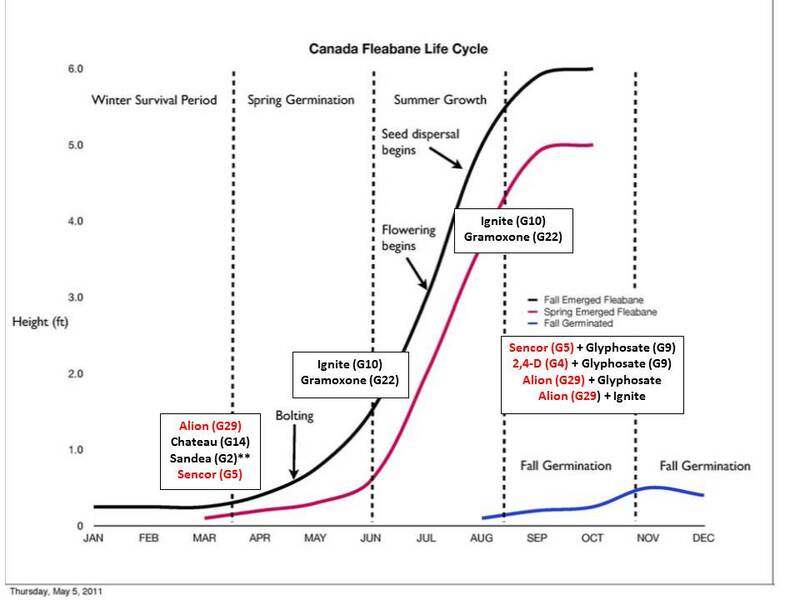 NOTE: Control of Canada fleabane is best with preemergence herbicide applications. Control with postemergence applications will always be best on small plants. Most labels are rated for control when weeds have fewer than 20 leaves or are under 15 centimeters (6 inches) tall. 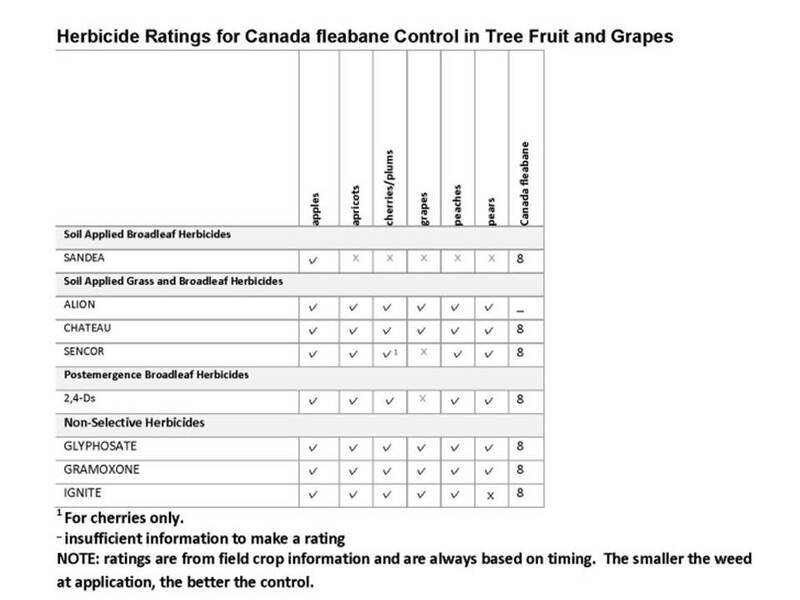 NOTE: It is likely that other products registered in tree fruit and grapes have efficacy against glyphosate resistant Canada fleabane; however, research trials need to be conducted. **Certain biotypes of Canada fleabane are known to be resistant to ALS herbicides. Where these ALS-resistant biotypes are known to exist, an appropriate registered herbicide, active against the weed and with another mode of action, should be used alone or in tank mixtures with SANDEA to control these biotypes. Canada fleabane is not on the Alion label in Canada; however, it is on the U.S. label. Canada fleabane is not on the Sencor label; however, many field trials in soybeans suggest adequate control. Daisy fleabane (a related species) is on the 2,4-D label. DO NOT APPLY 2,4-D OR SENCOR IN GRAPES. Non-chemical means of controlling glyphosate resistant Canada fleabane are tilling small rosettes regularly, mowing larger plants, or mulching in the spring. 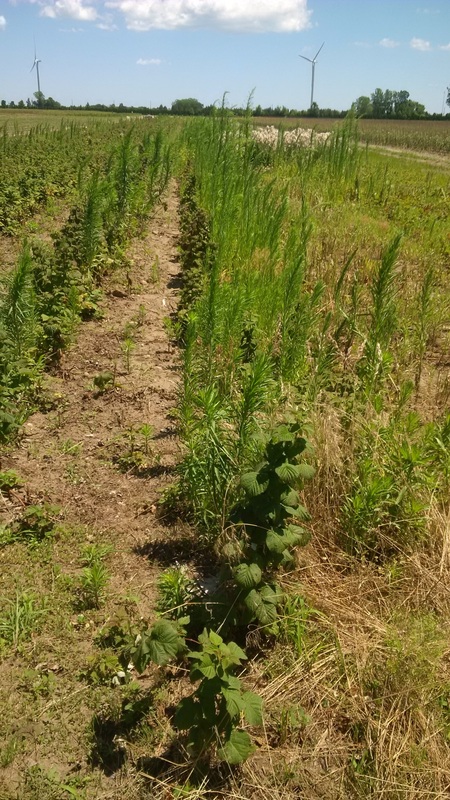 A commitment to using Integrated Weed Management – a combination of chemical, mechanical and cultural weed control strategies throughout the growing season will help reduce herbicide resistant weed species.